My first thought, after concluding that photography might be a good idea, was to enrol in some courses or go to evening classes. After all, one of the driving factors here is to meet people and to ‘do’ this hobby as a social exercise, as much as it aims to take a pic that doesn’t stink (catchphrase anyone?). I had a look round and quickly discovered the price of courses is pretty steep. This one @ LSP costs 300 pounds for 4 lessons. With this in mind, I think the social aspect may have to come into play in different ways. One of my tasks this weekend is to look around and see if there are any “Photography clubs” or similar which might suit me. 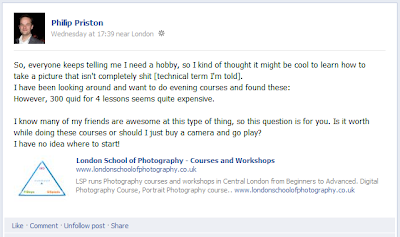 The Facebook conversation quickly segued into the subject of what camera to buy. There is a definite split of opinion here, with Gail & Steve going Nikon, Mike is the Canon man and Enrico making a pretty strong case for Sony. My next article on here will focus on my short-list of affordable cameras. I will likely be asking you to jump into the comments section of that article to offer opinions on each of them. Which is nice. Oh, and Enrico made me promise not to join the 365project before then sharing this little gem, “Stages of a Photographer“. This has gone some way to setting expectations, as well as confirming that Enrico is indeed a card!